Possibilities of using inductionmelting (IM) units with controlled metal movement for improving melting efficiency and produced cast iron quality were studied. Key words: induction melting, single-circuit melt circulation, intensive stirring, carburization. The firm Promat GmbH, Germany, developed a new heat-insulation material for application in the conditions of temperature and electric gradients, as well as increased mechanical loads characteristic for induction furnaces. DURATECXP is practically not subjected to destruction under mechanical loads and has an extremely high bending strength – up to 45 MPa at impact toughness of up to 30 kJ/m2. The material features a low temperature coefficient of linear expansion, high heat-insulating properties, low heat conductivity relative to apparent density, as well as high heat resistance and good machinability. Key words: heat-insulation material DURATECXP, glass fiber, induction furnace, spark-arresting chamber. The article discusses scientific and technological aspects of obtaining a quality Al-Ti-B master alloy by phase and chemical composition for inoculating aluminum alloys. Mechanism of inoculating aluminides when casting master alloys from liquid-solid state is briefly described. Key words: master alloy, aluminum, titanium, boron, zirconium, carbon, intermetallic compound. The transitional phases forming process in the consolidation area of bimetal materials steelbronze, steel – composite and structure of transitional shell were researched. By the metallographic research of obtained specimens interaction zones, the columnar ferrous phase growing from high-carbon steel toward the low-carbon steel in according to monotectic reaction was stated. Keywords: bimetals, consolidation zone, bronze, steel. Impact loading behavior of layered specimens (LS) produced by pressure welding of thirteen sheet blanks of titanium alloy BT6 was studied. It is shown that LS impact toughness depends on both the position of joining surface relative to a propagating crack and the presence of pores in the zone of solid-phase joining (SPJ). Key words: layered specimens, titanium alloy, pressure welding, impact toughness. There is determined an alloy composition in terms of its practical use as a material for making grids in generator modulator lamp structures with a laminated electron flow. It is shown that the binding strength of the obtained cast alloy is 5 times higher than copper properties while not being inferior by electrical conductivity. The copper-based alloy is designed for transport engineering (in aviation for avionics) and atomic power engineering products. Key words: cast copper alloy, composition, physicotechnical, thermomechanical and vacuum properties. 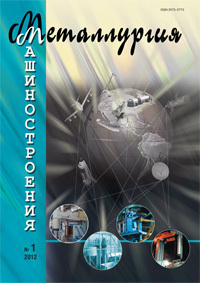 There has been developed and mastered a technology of making hollow steel ingots from 38ХН3МФАЛ and 38Х2Н2МАЛ steel for producing casing tubes of large diameter and length with dense and homogeneous metal structure, high yield, which is achieved by applying modern technology withusing a new method of designing and parameter selection for making a hollow ingot, providing optimal conditions for directional solidification of the casting. Key words: hollow ingot, directional solidification, riser, pattern tapers, feeding, axial friability, casting. There are the results of research the influence of temperature-timing conditions of hardened chromansil recurrent heating to defect nanostructure structure and characteristics. It is showed, repetitive hardening allow to operate the steel structure and characteristics at long-range. The finding recurrent hardening conditions allow to all-round increase the strength and ductility by contrast to customary hardening and heat refining technologies. Also, they allow to compact the heat treating time and achieve the same steel characteristics, that drawback steel. Keywords: phase pretransformation, defect structure, chromansil, mechanical characteristics, rehardening. Peculiarities of formation of ultra-fine-grained (UFG) structure in specimens from Ti6Al7Nb alloy obtained by intensive plastic deformation (IPD) are discussed. It is shown that application of equal-channel angular pressing (ECAP) in combination with thermomechanical treatment allows increasing the alloy’s strength up to 1320 MPa at elongation of 8%. Annealing at 300-600°C for 1 h led at 500°C to a strength increase up to 1400 MPa and elongation up to 10%. Key words: ultra-fine-grained materials, intensive plastic deformation, post-deformation anneals, structure and properties of titanium alloys. The dissipation of addition energy, accumulated in the composite granules of Ni–Al system after preliminary mechanical activation is studied. Mechanically activated composite granules were annealed at different temperatures, time and heating rate. The reduction of composite granules activity, depending on temperature and annealing time is found out. It is shown, that the energy release during annealing manifests itself in the form of composite granules self-heating, resulting in overheating. The overheat level varies from a few to several hundred degrees, depending on the furnace heating rate. Keywords: mechanical activation, composite granules, energy accumulation, annealing, energy dissipation, heat release, self-heating.